With all of the cold temperatures that have hammered the Midwest this winter, many have wondered how birds handle extreme cold. Much of North America’s avifauna migrate to take advantage of an abundance of food and calmer weather further south. Humans do the same, and we affectionately call them snowbirds. Grassland birds that breed in the Northern Great Plains make their southward exit in late summer and early fall, heading towards the golden grasslands of the Chihuahuan Desert of the southwestern USA and northern Mexico. 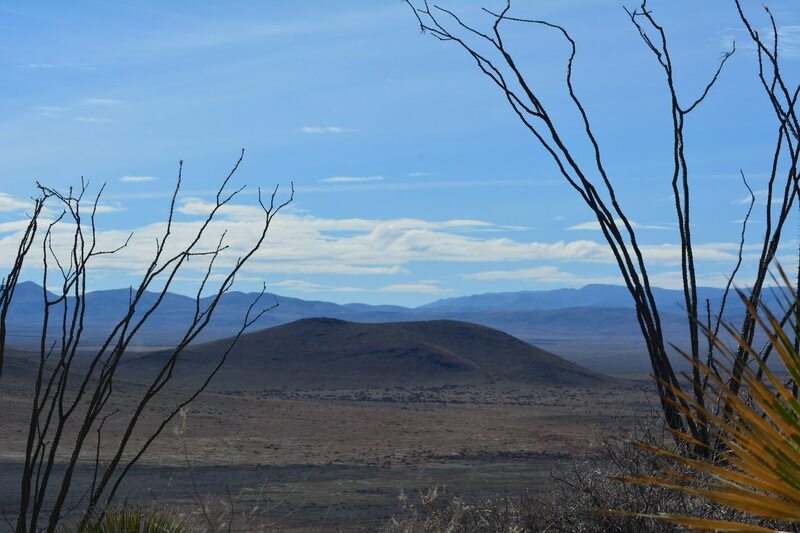 The stunning Chihuahuan Desert in winter. Don’t be fooled by this photo, though! It’s not blue skies and sunshine all the time. Photo: Laura Heredia (Field Technician). However, instead of spending their winter in blissfully tropical conditions, they face the prospect of overnight freezes, forceful winds, and—on occasion—snow that blankets the grassland and buries their food sources. Many small birds are able to slow down their metabolisms, saving precious energy reserves when times are tough. Their feathers are also very effective insulation and provide some level of waterproofing. Nonetheless, it is hard to imagine how they spend night after night tucked away in the grass surrounded by snow. 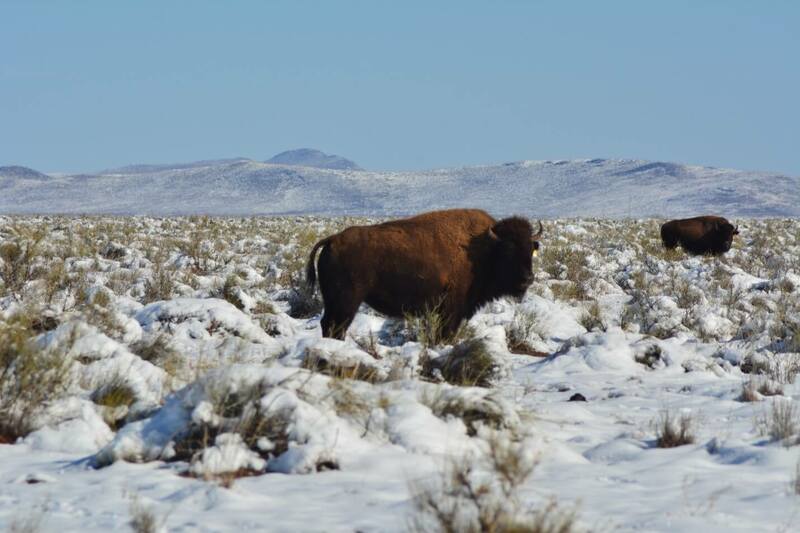 Rancho El Uno’s herd of reintroduced Bison don’t seem to mind the cold! Photo: Laura Heredia (Field Technician). 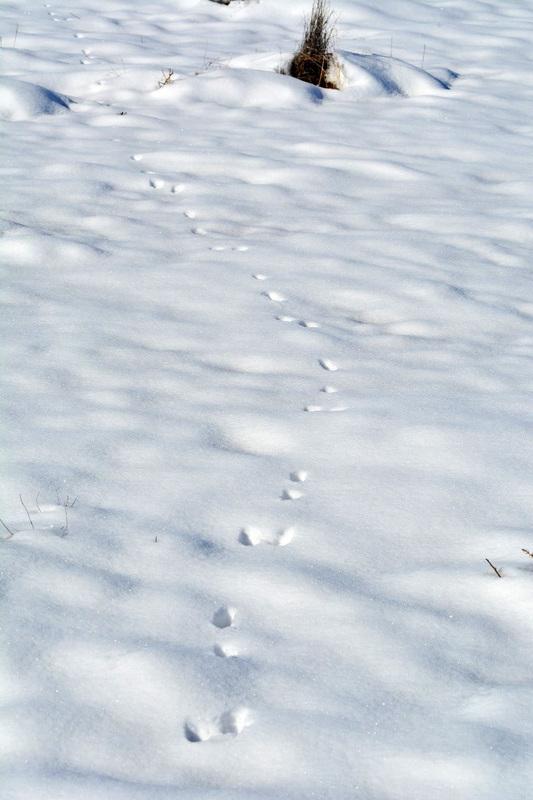 With all surfaces covered with snow how do grassland birds find the grass seeds and invertebrates that they depend on for food? Photo: Laura Heredia (Field Technician). Despite several days of 6-10 inches of snow coupled with freezing temperatures, many of the grassland birds we are monitoring at Rancho El Uno near Janos, Chihuahua survived the harsh weather. We know that birds survived because we are tracking individual Baird’s and Grasshopper Sparrows and Sprague’s Pipits with radio-telemetry. This technology allows us follow individuals over the course of the winter and collect information on their movements and habitat needs, data which will inform habitat management and restoration in the Chihuahuan Desert. 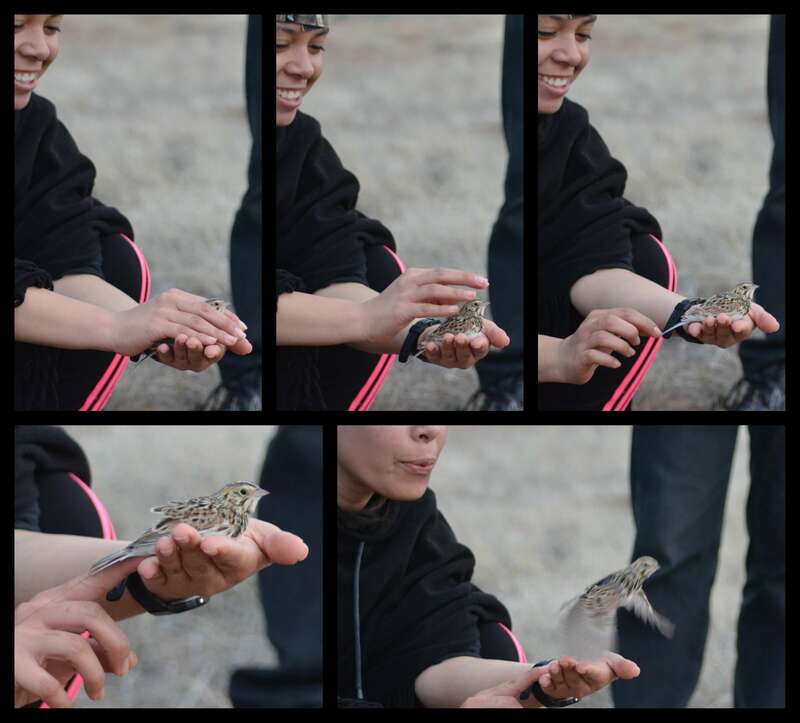 A Baird’s Sparrow outfitted with a radio-transmitter is released by volunteer Paola. Photos: Laura Heredia (Field Technician). 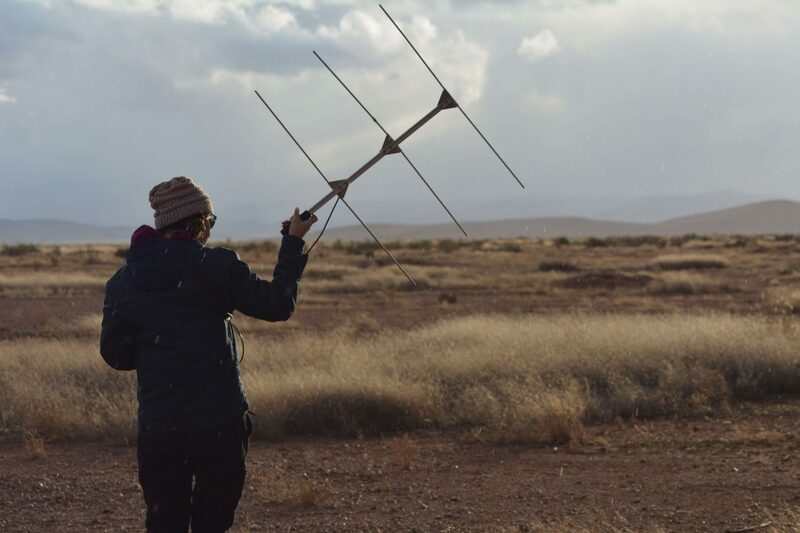 Crew lead Mariana Martinez uses a Yagi antenna to search for radio-tagged sparrows and pipits. Photo: Laura. Heredia. In order to be effective, efforts to conserve grassland birds must extend to local outreach in northern Mexico. Our longtime partners from IMC-Vida Silvestre (IMC-VS) lead environmental programs for kids in addition to their landowner outreach and habitat improvement projects. More recently, Dulce Barraza of IMC-VS has begun working with a Mennonite school in Cuauhtémoc, Chihuahua providing coursework on migratory birds and environmental awareness and leading activities such as construction of pollinator gardens. The Mennonite community is an important piece of the conservation puzzle in Chihuahua but cultural barriers have made it difficult to include them in the conversation. This exciting new partnership follows years of efforts to reach out to the Mennonite community. It was therefore a very moving day when a class of Mennonite students and their teachers joined us in the field to capture and band grassland birds. Even though we didn’t catch a single bird that day, the smiles on everyone’s faces, simultaneous conversations in Spanish, German, and English, and universal irritation from grass seed-infested socks gave me a glimmer of hope for our shared birds. It doesn’t matter who you are and where you come from, we can all at least try to work together to make a difference. 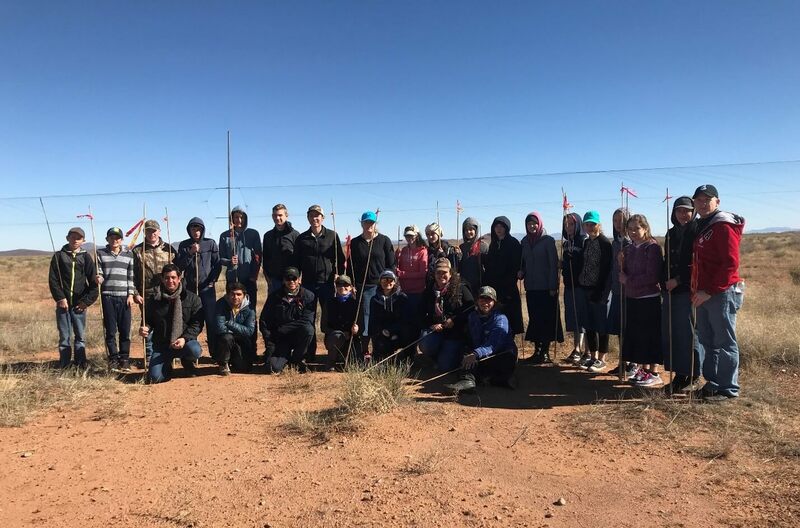 Mennonite students from Cuauhtémoc, Chihuahua join the Bird Conservancy and IMC-VS team in front of mist nets used to capture grassland birds. The bamboo sticks help us keep birds between us and the nets. Photo: Dulce Barraza of IMC-VS. This work has been generously supported by funds from the USFS International Program, World Wildlife Foundation: Fundación Carlos Slim, The USFWS Neotropical Migratory Bird Program, and the Canadian Wildlife Service. Special thanks to Jim Chu of the U.S. Forest Service for his vision and support over the years.